The text below is from the second Living a Creative Life tactical plan, current to March 2015. Please refer to the Tactical Plan section for background on what tactical plans contain and how they will be used. The outcomes and visions of Living a Creative Life will be realized through the work of signatories. Calgary Arts Development will continue to engage signatories throughout the life of the strategy and will support them in aligning their current and future activities to the tactics below. Calgary Arts Development will also be responsible for collecting data and reporting back on success indicators annually. Vision: Calgary strongly attracts artistic talent to live, work and achieve artistic excellence. Outcome One: Calgary artists and arts organizations have access to an ample range of resources required to support artistic creation. Driver: Develop sustainable funding models and other initiatives to address the evolving needs of Calgary’s arts sector. Work with the private and public sectors to strategically invest in arts spaces. Work with the private and public sectors to strategically invest in the ongoing operations and programs of arts organizations. Research and develop new investment trends that push for social return on investment, such as social impact bonds and working capital loans. Create events and programs to increase and strengthen partnerships between the arts and the private sector. Work with the private, public and arts sectors to create funding opportunities for independent artists. Continue ongoing public consultation and monitor the current state of the arts sector. Driver: Provide ample opportunities for emerging artists to transition from school to their professional arts careers. Engage with and encourage the artistic practices of early-career artists. Create large-scale opportunities through which emerging artists can showcase their work. Foster connections between arts organizations, mentors, community partners and post-secondary institutions to help develop emerging artists’ entrepreneurial skills. Driver: Increase opportunities for artists and arts organizations to network, learn and share their knowledge and resources. Pool knowledge from across sectors to increase awareness of rental space available for creation, performance and exhibition, varying in size, type, price and location. Create platforms or events where stakeholders engaged with the arts and arts organizations can develop relationships through discussing current needs in the sector. Overall revenue and expenses of sector (divided into sources). Wages and annual earnings of careers in sector. Percentage of arts organizations operating at a surplus or deficit in the most recent fiscal year. Percentage of arts organizations with a current assets to current liabilities ratio greater than one in the most recent fiscal year. Number of working artists and of workers in arts occupations. Number of full-time equivalents and artists employed by non-profit arts organizations. Number of new graduates from Calgary art institutions. Number of adequate, available and affordable arts creation, production, rehearsal, performance and exhibition spaces. Number of emerging artist opportunities. Reported perceptions on access and use of professional development opportunities for artists. Perceptions on peer-to-peer networking opportunities and connectedness of arts community. Outcome Two: A strong arts sector is highly valued by Calgarians and is part of what defines us as a city. Driver: Raise Calgarians’ artistic discourse to a higher level. Increase the amount of informed arts criticism that appears in Calgary media. Maintain or increase investment in publicly accessible art. Increase public awareness of Calgary’s local arts awards. Driver: Encourage Calgary’s private and public sectors to incorporate the arts into their operations and business practices in a way that is meaningful for them and impactful to their stakeholders. Create artist residency programs within organizations and institutions across all sectors and neighbourhoods. Strengthen existing and create new municipal arts events and programs such as Calgary’s Poet Laureate Program and the Mayor’s Lunch for Arts Champions. Include arts sector leaders in the decision-making processes surrounding important municipal issues. Driver: Increase Calgarians’ familiarity with arts opportunities available to them across the city. 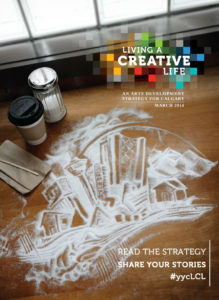 Increase and encourage dialogue about the many ways that Calgarians live creatively every day. Direct more resources to ongoing, widespread promotion of arts experiences across the city. The Calgary Foundation’s Vital Signs Arts & Culture grade. Awareness of the arts scene in Calgary among both Calgarians and non-Calgarians. Volume (number of articles) and tone (qualitative nature of articles) of traditional media coverage. Volume (number of mentions) and tone (qualitative nature of mentions) of social media. Outcome Three: Calgary’s arts professionals are able to dedicate themselves to their careers while maintaining a healthy and fulfilling quality of life. Driver: Increase the affordable housing options available to Calgary arts professionals. Embrace the opportunity to include arts spaces where artists can live and work in new developments across the city. Increase awareness within the arts community of programs that address affordable housing. Support existing and proposed municipal initiatives that address affordable housing in Calgary. Driver: Increase the resources available to arts professionals to help them manage their personal health, wellness, safety and finances. Establish new resources specifically to address the health, wellness, safety and financial needs of artists. Increase awareness within the artist community of programs that address health, wellness and financial literacy. Adequacy, suitability and affordability of housing of arts community, based on Canada Mortgage and Housing Corporation standards. Assessment of savings habits among artists. Number of arts professionals with access to EI, receiving welfare and with retirement plans and/or pension plans. Percentage of arts professionals covered by extended health benefits and WCB insurance, working in safe conditions and reporting access to health care professionals when needed.